In my endeavor to promote healthy living, I have decided not to buy any sweet from the market. 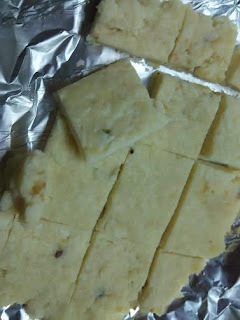 So tried making this Kalakand (milk sweet from cottage cheese) at home. It's better to get going in the kitchen than marketing for the same stuff outside. Mix milk powder with milk, sugar, and boil in a heavy bottomed pan. Let it simmer on low flame until it becomes dense and the milk is reduced to half. Stir well so that it does not stick to the bottom or sides of the pan. Then add paneer to the mixture. Keep stirring until the mixture becomes dense and leaves the sides of the pan. When it solidifies. Switch off the flame. Pour the thickened mixture over the greased plate. SMoothen the top with a spatula. Let it cool for a while. Once it cools, cut and serve.